On a rainy night last weekend, my We Heart Astoria colleagues and I ventured over to Tufino Pizza before going to check out the friends & family event at The Brass Owl. Although I've heard so many great things about it, and it's totally my kind of place, I've never eaten there yet, so this provided the perfect opportunity. Very much a place of comfort, warmth and refuge during the cold rainy weather, Tufino offered everything we wanted at that moment. On a busy Saturday night, it was full, but not so much so that we had to wait for a table. Loving the warmth emanating from the wood fired oven that bears the name Maria (the owner's wife's name), we sat down at a four top not far from it and marveled at the beautiful pies it produced. The crowd was a mixed bag, which speaks to Tufino's versatility and included everything from couples, small groups of friends as well as families with children. Going for the pizza was a no brainer and between the three of us, we shared two pies and a salad, which was just enough food. Caesar Salad - While this was just a simple Caesar salad, it was done right. Everything about it was delicious, including the crispy romaine, the airy croutons, tangy cheese and the garlicky dressing. Although Caesar sometimes gets a rap of being too heavy, this one was anything but. Pizza - Ordering two Neapolitan pies to share including the Il Greco and the Pistachianco, was a good idea. Although the pies came sliced, it was a little tough to tell where to separate them, so the extra pizza cutter we had at our table came in handy. 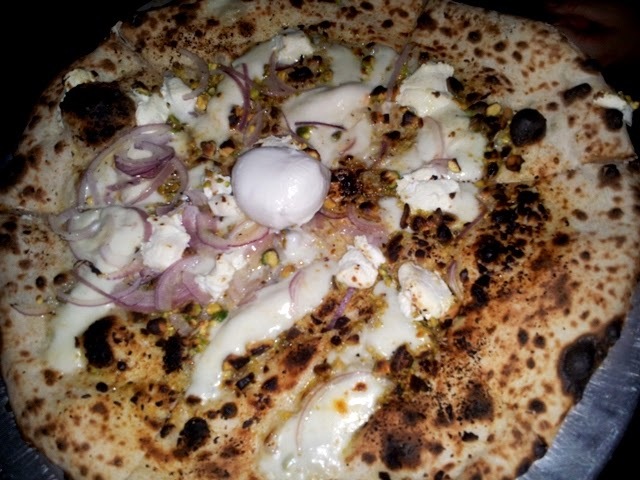 Out of these two varieties, the Pistachianco with fior di latte mozzarella, roasted pistachios, red onions and fresh ricotta cheese was a clear winner. The pistachios were the star of the show, as they were crunchy, chunky and earthy. I wasn't used to this type of toothsomeness in my pizza, but completely loved it. 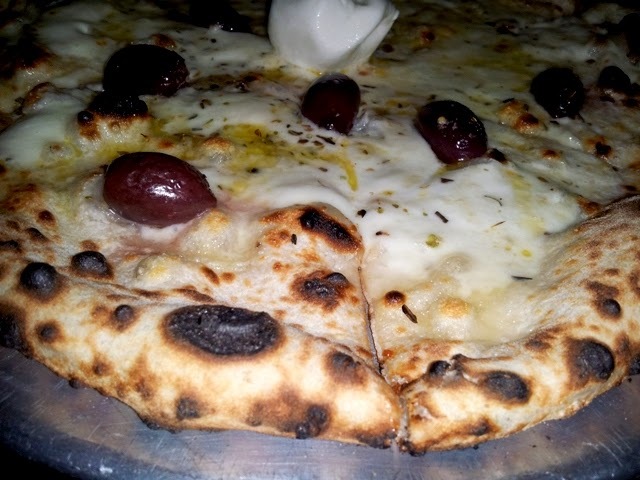 Not to say that the Il Greco with Kalamata olives, oregano and fresh lemon juice wasn't good, it was just a tad salty for my liking. We enjoyed nice service during our experience, and while I can't say it was anything out of the ordinary, all dishes came out in good time, the staff was cordial and generally quick with the bill. Costs are moderate and set us back about $32 per person, which included 2 glasses of wine.